Devin Johnson (Ph.D. Statistician NOAA Fisheries Marine Mammal Lab) will be presenting today (4/1/19) from 3-4pm in the Physics and Astronomy Tower, Room C520. After a brief tour of northern fur seal ecology and traditional resource selection models for telemetry data, we will examine a new approach based on modeling animal movements in a pixelated landscape. These discrete-space continuous time models allow inclusion of spatial habitat information in a way that does not depend on the rate of location acquisition. Therefore as telemetry devices improve, and locations are measured at finer time scales, the inference remains comparable. These models also allow spatial and temporal habitat covariates and temporally changing responses by the animal. One of the major benefits of the model is that the likelihood can be approximated with a Poisson likelihood, therefore, any GLM software can be used to fit the model, such as glm(…) or gam(…) in the R statistical environment. The methodology is demonstrated by analyzing the movements of 15 northern fur seal pups on their first migration with respect to surface winds, geostrophic currents, and sea surface temperature. Devin Johnson has been a statistician at the NOAA Alaska Fisheries Science Center’s Marine Mammal Laboratory since 2005 where he conducts research on statistical problems in ecology focused on animal movement, capture-recapture models, and Bayesian nonparametric methods. Devin completed his masters and PhD in statistics at Colorado State University and has worked as an assistant professor at the University of Alaska Fairbanks, where he completed his undergraduate degree. Considering the ultrasound industry around Seattle, and the large number of students that have been getting industry jobs upon graduation, this would be the course to truly prepare them for such a career. There are no prerequisites. East Asia led by the continuing growth of China, will soon become the largest economic region in the world and, in due course, the Asian Century may succeed the American Century. Whatever the ultimate result, global affairs in the first half of the 21st century will focus on the challenges of evaluating Asian regionalism, integrating Asia into the world and the capacity and will of the United States to lead. The global political economy will be rapidly transformed by: 1) the digital revolution; 2) a dramatic shift in economic power; 3) new multilateral international institutions to mediate these changes; 4) new types of security threats, military cyber and economic; 5) a challenge to the U.S. and the universality of the democratic capitalist principles; and 6) developing a viable regional order with a hegemonic China; 7) erratic Trumpian nationalism. The course discusses the historical forces that have given rise to these ideas globally and especially in East Asia and frames the questions facing this region in the increasingly inter-dependent but non-convergent 21st century world. Graduate students will take a five to six page take home final and write a 12-15 page paper on a topic of their special interest, established in consultation with the professor. Undergraduate grades will be primarily based on a take home final examination and two five-page papers on topics worked out with the professor. All students are expected to do the readings and participate in classroom discussions on the readings of the week elaborated by 30 minute lectures by the professor. Quarterly course lists divided by region for the Jackson School of International Studies. This course counts for International Studies majors and European Studies majors. 21128 B 5 TTh 330-520 MEB 245 Klapaki,Nektaria G.
The course explores the interplay between migration and multiculturalism in the modern and contemporary Mediterranean focusing on the experiences of the Greeks from the nineteenth century to the present. We examine immigrant communities of the Greek diaspora in different historical periods and multicultural settings: as part of Smyrna in late nineteenth-century Ottoman Empire and as part of Alexandria in twentieth-century Egypt. Conversely, we consider how the phenomenon of immigration to Greece from the early 1990s onwards has been impacting the previously homogenous, monocultural Greek society into an increasingly multicultural one. If your students are looking for an I&S or NW course for Spring quarter, please consider ATMS 103 Hurricanes and Thunderstorms. This class will not be offered again until Spring 2020. Explores the science, history, and impacts of thunderstorms and hurricanes. Includes basic processes responsible for thunderstorms and hurricanes and for the lightning, hail, high winds, and storm surges that accompany them. Presents significant historical examples, along with the impact on human activities, strategies for personal safety, and societal adaptation. URBDP 200: Intro to Urbanization – space available, open to all students! In 2007 we reached the tipping point: more people now live in cities than in the countryside. What is going on? Why does it matter? How do cities work? How can they be different—and better—in the future? URBDP 200 is an introductory general education course for a wide range of undergraduates. It is for anyone curious about cities. It explores why the world is urbanizing and what consequences that has for people’s lives. It examines why cities take on different character — dense or sprawling, segregated or integrated, thriving or stagnant, car or transit oriented, democratic or authoritarian. It is a 5-credit course is open to all majors, satisfies the I&S requirement, and counts toward the Urban Planning minor. It a great choice for students considering Geography, Sociology, Political Science, Anthropology, Comparative History of Ideas, and Environmental Studies. Comments Off on URBDP 200: Intro to Urbanization – space available, open to all students! For students who still need to register and fill out their Spring 2019 schedule, we have a course that you may be interested in. Space is still available. Enroll today! The Urban Studies program has an exciting course offering for Spring 2019. If you are interested in learning outside the classroom and experiencing Urban Studies in practice at site visits such as Gig Harbor North, Port of Seattle, the Nisqually Refuge Restoration Project, and more, Planning & Development in the Puget Sound is for you. All students are welcomed to register! This course provides an opportunity for students to gain a first-hand impression of major public, private and public-private initiatives in the Puget Sound region. These initiatives are considered especially good examples of broader processes associated with contemporary urbanization, private-sector development and public-sector management. The course is built around a series of fieldtrip visits. Topics include: historic preservation; neighborhood/business redevelopment; housing and residential development; globalization, and economic development; smart growth, sprawl and inter-jurisdictional planning. Assessment is based on participation and on two 5-7 page papers that combine fieldwork observations with academic scholarship on the relevant topics. The $75 course registration fee covers transportation and site registrations. 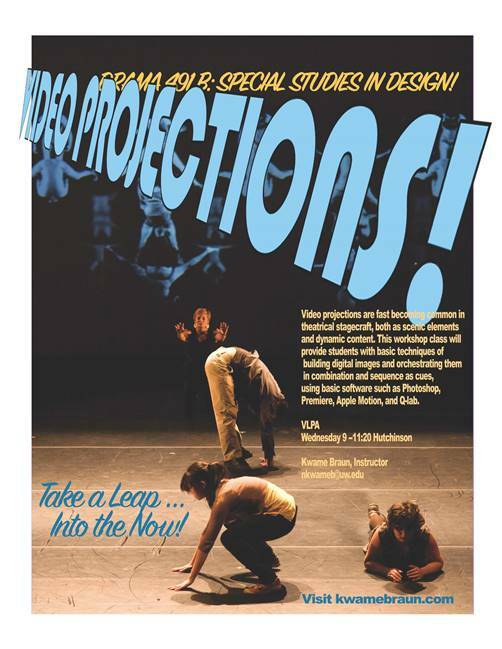 We have a few spaces left in our DRAMA 491B, Video Projections. Interested students should email the instructor (nkwameb@uw.edu) for the entry code. Include information on your creative pursuits, memorable theatre/projections experiences, familiarity with computer design programs. 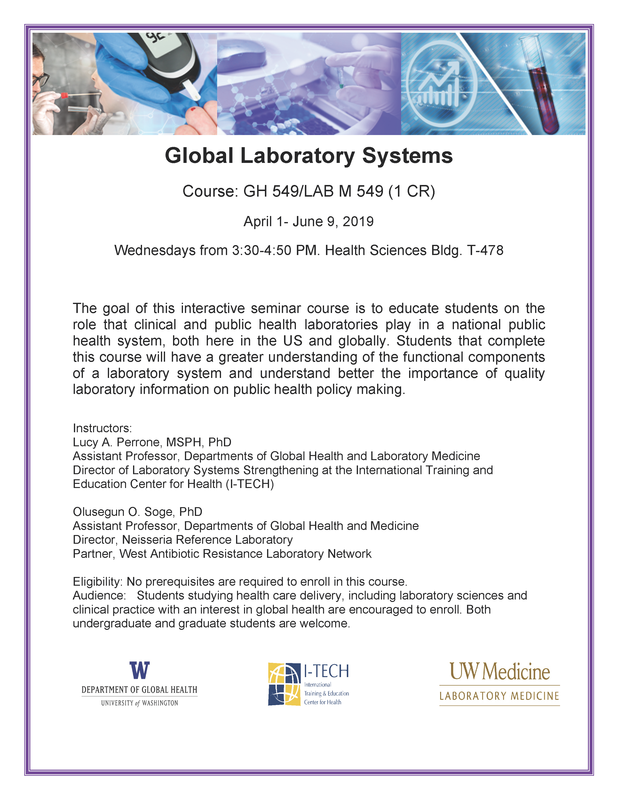 We have a new joint course offering from Global Health and Laboratory Medicine for undergraduate and graduate students and no prerequisites! An information sessions will be held April 3 at 3:30 PM in Anderson Room 22. …it’s like study abroad, without the passport and jet lag. The value of water is recognized world-wide. Even in wet regions, such as the Pacific Northwest, it is important to apply sustainable strategies that recognize the inter-connections among water resource, drinking water, and wastewater. It is additionally important to recognize that culture plays a large role in ensuring that decisions match the needs of local communities. This course will examine the intersection of the water engineering sectors and local decision-making, including water implications of climate change predictions for temperate rain forest and wet forest regions. 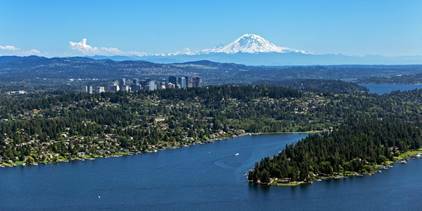 The Pacific Northwest will be used as a learning "laboratory". Students will engage with water professionals and decision makers from public utilities, regional engineering firms, tribal nations, and local/regional government. The intersections among these groups and their view of the water sector will be examined at differing scales (state, city and small town) and from multiple cultural perspectives. Activities include: visiting wastewater treatment plant, engaging with tribal leaders, eating foods with cultural and regional water importance, visiting tidal flats, rain forest hiking, rafting, and whale watching. Sections are available for all majors; undergraduates and graduate students welcome. Get all the work finished for the 5 credits course by July 7, and still have time for summer job/internships, or other summer courses. Course Activity Fee $1450 includes camping fees, dormitory fees, program transportation, program-related park and museum entrance fees, hiking trail fees, ferry’s whale watching, rafting, and tree canopy climb. Are you unsure if you want to attend graduate school? Do you know for certain that you want to attend graduate school, but are not sure how to write a quality personal statement? Not sure what program or school you want to attend? This 2 Credit, ten-week course is for juniors and seniors who know they want to pursue, or are considering the possibility of graduate education. During the quarter, students will learn first-hand from faculty and staff involved in graduate admissions how to find programs that fit their interests, and how to prepare application materials. Spring 2019 Arctic Studies course on Indigenous Peoples – seats open! We still have seats available in the upcoming course, ARCTIC 401: Indigenous Peoples in Arctic Governance. This course is taught by the Fulbright Visiting Research Chair in Arctic Studies, Dr. Andrew Chater. The course examines the unique position of Indigenous peoples in the governance of the Arctic region as institutions grapple with issues such as climate change, development and security. It will focus on the position, role and influence of Indigenous peoples in the Arctic Council and beyond. A key emphasis is evolution in Arctic affairs as various actors adapt to change in the region. This 3-credit course is an excellent option for students who have interest in current affairs in the Arctic, and counts directly towards the Arctic Studies Minor (offered jointly by the Canadian Studies Center and the School of Oceanography). Comments Off on Spring 2019 Arctic Studies course on Indigenous Peoples – seats open! Wildlands Studies – Upcoming Summer Program Opportunities! a life-changing and eye-opening experience. Program listings provide detailed information about each project location, research activities, academic curriculum and credit, costs and instructor profiles. As concerned citizens we invite you to join one of our teams, and help in the effort to solve critical problems facing our wildlands and wildlife populations. Applications are open to all programs through the spring of 2020, visit our website for more information. LEARN HOW TO HELP SAVE IT. Comments Off on Wildlands Studies – Upcoming Summer Program Opportunities! Please share the attached with any students who may be interested in this opportunity to earn 1 credit during spring quarter participating in creating the next issue of FieldNotes, an online journal created by undergraduates to share their environmental research. The course is offered as FISH 497, but is open to all majors. This highly recommended Jackson School course still has space this Spring 2019. Counts as an elective for Asian Studies, European Studies and International studies majors or minors. There are many ways in which a society may be deeply divided. Some divisions lead to civil wars, while others result in endless low level problems. Four deeply divided societies will be studied: the United States, the former Yugoslavia, Afghanistan, and Vietnam. In the first there is now no civil war, but there are very bitter political and cultural divisions, some of them still a legacy of America’s own civil war. In the others there have been or continue to be wars, but even when they have ended, deep divisions remain. In all the United States played a big role. We will see if any lessons about how to moderate divisions can be drawn from these cases, or why certain kinds of political actions can make things worse.